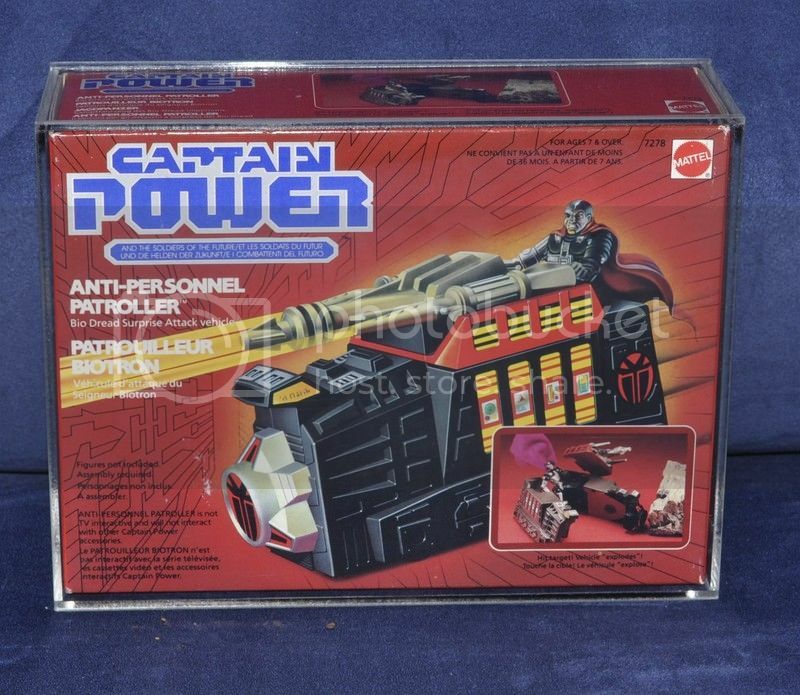 Not sure how many people here even remember this series, but as it was the first every interactive toyline, I thought those who might remember it might get a kick out of seeing my Captain Power collection. It's still very much a work in progress in terms of vehicles, but it's well on the road to completion. Missing in terms of photos are a loose Soaron Beam Deflector, a second MISB sealed Skybike Launcher, a loose Trans-field Communication station, and a near complete Powerbase. Last edited by bowspearer; 23rd September 2017 at 10:10 PM. They look like GI joes, are they about the same size? Oh boy, this is going to be an interesting one then, and to give you some room to edit and rephrase, I'm not going to quote what you just said . 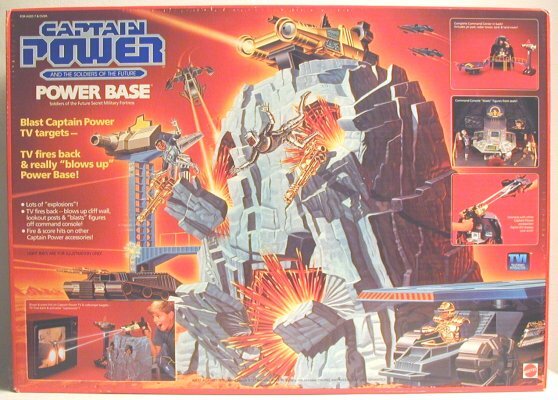 Captain Power was a MASSIVE project budget wise, between Mattel Toys and Landmark Entertainment that was unfortunately killed off by politics. 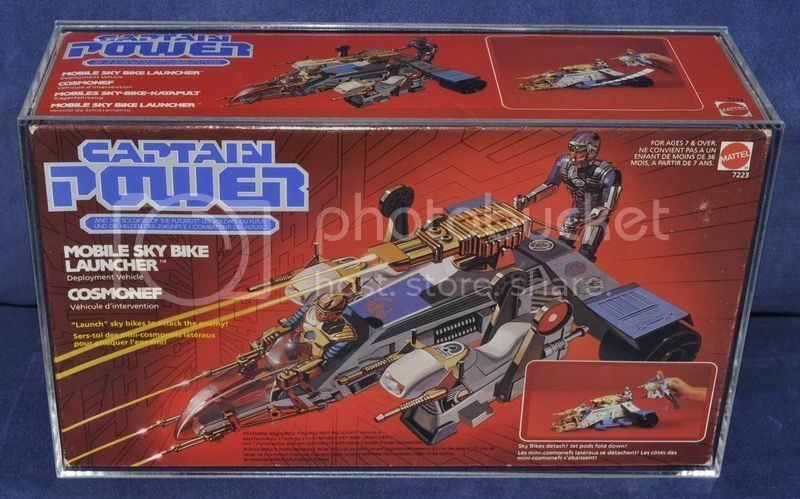 Brought out in 1987, Captain Power and the Soldiers of the Future was a cross between Centurions and Terminator. Earth, 2147. The legacy of the Metal Wars, where man fought machines—and machines won. Bio-Dreads—monstrous creations that hunt down human survivors...and digitize them. Volcania, center of the Bio-Dread Empire; stronghold and fortress of Lord Dread, feared ruler of this new order. But from the fires of the Metal Wars arose a new breed of warrior, born and trained to bring down Lord Dread and his Bio-Dread Empire. They were "Soldiers Of The Future"--mankind's last hope. Their leader--Captain Jonathan Power (Dunigan), master of the incredible Power Suits, which transform each soldier into a one-man attack force. Major Matthew 'Hawk' Masterson (Peter MacNeill), fighter in the skies. Lieutenant Michael 'Tank' Ellis (Sven-Ole Thorsen), ground assault unit. Sergeant Robert 'Scout' Baker (Maurice Dean Wint), espionage and communications. And Corporal Jennifer 'Pilot' Chase (Jessica Steen), tactical systems expert. Together they form the most powerful fighting force in Earth's history. Their creed: to protect all life. Their promise: to end Lord Dread's rule. Their name: Captain Power And The Soldiers Of The Future! The series was co-written by Larry DiTillio and J. Michael Straczynski and each episode cost roughly a million dollars to make, while arguably being one of the first shows ever to use entirely CG characters (the biodreads). The show sadly was about 20 years ahead of its time and paid the price for it. Much like Babylon 5, Straczynski had a 4 year storyline planned with similar complexity. The toys were also revolutionary. While the figures were 3 3/4" much like GI JOEs, but with straight arms and no waist articulation, the toys were the first truly interactive toys. While a few of the toys were motorised, the majority of them were designed to be interactive with the show, each other and a set of training tapes (pictured in the OP). The way it worked was that each interactive toy doubled as a light gun, with an infrared lamp, an infrared sensor and a score counter. The score counter started at 20 and decreased or increased depending on whether you took or scored a hit based on what might have been happening in the show or on the training tape at the time. When the score counter dropped to zero on the Interlocker, the Powerjet or the Phantom Striker (which I'm still missing), the cockpit would eject. When the counter dropped to 15, one of the 2 gun emplacements "blew up" (an ejector mechanism forces the figure and mountain face/turret for the emplacement out of the power base). At 10 points, the other turret blew up. At 5 points, a large hole gets blown in the front of the base (a large panel at the bottom of the power base gets ejected with another smaller panel). At 0 points, the seats around the control centre computer violently shake back and forth, throwing the figures out of their seats. The other exception to this was the Energizer, which for the 1st 15 seconds, reduces the score counter of anything within its field. However after that 15 seconds, it actually increases its score. Of the toys, the hardest to get hold of are the Blastpak1200 and the Anti-Personnel Patroller, with limited amounts of them surfacing. The show is set for a resurgence, with an official DVD release coming at the end of the year, with a new toyline possibly to follow. Ha ha hA! I need no room to edit and rephrase, I hadn't heard of them, they look about the same size of Joes and the name sounds like a KO name, you know, like some dogdy chinese version of Superman, but called 'Capt Powers' instead coz it sounds cool. Whole TV show was Live action hey? Seem to be a pretty cool set of toys jusging by what you could do with them. Do you know how much they were at original retail? The production values look very akin to Power Rangers except for the CG work, which to me look far superior to Power Rangers! I'd never heard of this line either, so this has been an interesting read Bowspearer - Cheers for sharing man. Heh all good, just one of those funny quotable quotes was all . Yeah the training tapes were a mix, with the intro being live action and the actual interactive part of them being animated, but the series itself was live action. No worse than Tron or The Last Starfighter were . Remember this was the really early days of CG. In fact the cost was so high that they actually had to cut Stingray and Tritor from the show due to budget constraints. The other thing is that we're talking about 80s production values at play with the intro- camp is a given . Not sure with Australia- I found out recently that they did get a limited release here, much like C.O.P.S. and Visionaries, but I never owned any of the toys as a kid, just saw a few eps of the show and it stayed with me. I've imported my collection from the USA and France. In terms of retail price in the US, an old Sears Catalogue has the figures at $3.99, the training tapes at $14.99 each, the Energizer at $19.99 and the Interlocker, Powerjet and Phantom Striker each at $35.99. Not sure how much the Power Base was, but I imagine it would have been close to the $99.99 mark. EDIT: To save double-posting, here's the first episode of the series uploaded on youtube for anyone who is curious, as well as a few toy commercials: http://www.youtube.com/watch?v=BQapMkdIuSs , http://www.youtube.com/watch?v=FHZ5FTPYuWE , http://www.youtube.com/watch?v=oINYNmrPZCg . I remember talking to Larry DiTillio about 10 years ago about this show, and he was telling me that he was trying to get it brought back, but after a couple years trying, it just wasn't going to happen. It was a shame, because it had so much potential and was so short lived in the 80s. I also remember seeing an advertisement in one of the Gen1 TFs comics for the interactive toys for the show. It showed a kid pointing a spaceship toy at a TV, with its cockpit being ejected. I know he's not the only one. Straczynski's keen to get it back too as he's already got the other 3 seasons planned out for it, with scripts written for season 2 (not to mention that it made him determined with B5 to actually see his story arc make it to the screen for all 4 seasons). Also, it looks like the situation with a relaunch might have changed. At the very least there's the DVD release at the end of the year, and from the rumblings around, quite possibly a new toyline at least, which potentially means new show. It'll be interesting to see what comes of it. I guess after 10 odd years, they've been able to convince enough people. Larry just sounded so defeated about it back then.